Chinese backpackers are quite a rarity. Whether on or off the beaten path, one can travel for months and only encounter a few. Sure, there are package tourists, holidaying families, and the odd traveling couple, but Chinese solo independent travelers with a taste for adventure, cultural immersion and roughing it are rare, period. When I met 26-year-old Wang Ke (his real name… I suggested he picks an English name if he plans to go to a place with lots of British people), I thought he was Japanese. His haircut, facial hair, “backpacker uniform” (baggy pants, Same Same T-shirt, flip-flops, hippie wristbands) and demeanor were much more like those of the young chilled out Japanese dudes than any Chinese person I’ve met on the road. But no, Wang is born and bred in Beijing, and since he has quite a few things to say, I asked him for an interview and he agreed gladly. So here is the transcript, translated from Mandarin to English, of our conversation over African ghetto street beef skewers. So, tell me, how long have you been traveling? Since September 27th of last year. So, about 11 months now. How much did you save for this trip? 60 000 yuan, or about 10 000$. I was self-employed, working as a travel agent in Beijing. Started in the Philippines, then Thailand, Myanmar, Singapore, Indonesia, Malaysia, Laos, Vietnam, Sri Lanka, then I flew to Africa which I’ll explore for a while. 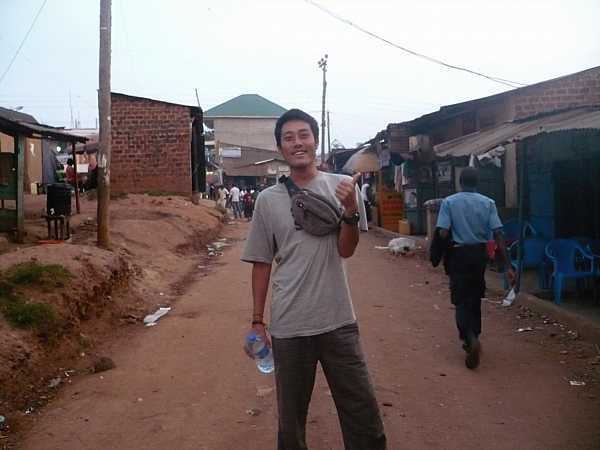 I started in Kenya, then made it to Uganda where I’m now. I’ve been in Kampala for 20 days. Yeah, but I like it. I made friends (including the local guy that introduced us to each other), I rest, and it’s convenient, because I have a free place to stay. I live in some empty room of a KTV. A KTV?! Like, a real Chinese-style karaoke bar? Yeah, there are lots of Chinese people working here in Kampala so there are real Chinese restaurants and KTVs. The boss is from northeastern China, and he’s nice enough to let me stay there, with the hookers. They’re pretty cool too, all of them hardened northeastern chicks! They’re crazy, hahaha! Hahaha… that’s interesting. Have you met a lot of Chinese backpackers so far? In SE Asia, a lot. In Africa, only three so far. Seems like Chinese people, well, actually people from all over are scared of traveling solo. Have you encountered any difficulties so far? In Kenya I was in a matatu (minivans that work as buses) and some guy was really staring at my bag. He wanted to steal it I think. So I took it closer, and kept it between my legs. Also, once in Myanmar, I got charged a double price. To take the bus from Yangguang to Zhaityu Pagoda, they have prices for foreigners and locals, usually I managed to get the local price by speaking Burmese to them, but it didn’t work, so I had to pay 7000 instead of 3500. Those are the only things you can think of? No danger, or problems? No, not at all. Everybody has been friendly. That’s pretty cool that in almost a year the only inconvenience was this minor little thing. And wait, did you say you can speak Burmese?! How’s that? Well, just a little of course. I learned some to get by, and especially in Myanmar it’s useful, because I got local prices, except that one time. I also speak a little Thai, a little Bahasa Indonesian, a little Swahili… and English. I didn’t speak any when I started. All I knew was “how much?” and “where is…?”. But… you’re totally fluent now. Took only 11 months? No, no, my English is very poor. (Typical Chinese modesty). But yeah, that’s a good thing about traveling. A lot of people speak English. And you can speak Chinese too… that must have been handy in Singapore. Malaysia too. And southeast Asia, because there are many Chinese people there now. What advice do you give to Chinese people traveling? I think they should go and experience different cultures. Lots of them go to Singapore and Malaysia, because it’s the same culture. I like Africa, because it’s a very different culture. And even when they go to other countries, they only want to take pictures to put on Weibo, or show off their money. I know a lot of Chinese people go to India too. I have some friends there. I always tell them to come to Africa but they don’t want. India is easy. It’s a tourist destination. Many people are scared of going to India, or go and don’t like it. It’s not easy as you might think. It’s crowded, and dirty, many travelers try but just can’t stomach it. (He points around, to the unpaved alley of the shantytown we’re sitting in, and says in English) Here clean?! You got a point. Actually I also don’t understand why so many people don’t want to come to Africa, yet India is probably more underdeveloped and many people have been going there for a long time. In China everybody thinks Africa is dangerous. But I don’t think it is. I agree. You just have to be a bit careful of course. What do you think about Africans? They’re funny! And they’re not rude. In Uganda at least, in Kenya there are many rude people. And what’s your favorite country so far? Myanmar. Beautiful places, and cheap. I like to try lots of things. In China my life was better but now it’s more interesting. I also learn many things: culture, and about money. I don’t drink anymore because it’s expensive, and quit smoking. Well… I still buy cigarettes two at a time, but in China I was smoking more than a pack a day. I lost weight too, I’m 65 kg now, I used to weigh 85 kg. Traveling is great! I’m applying for a US visa, and if I get it I’ll go stay there for four months, working in a restaurant, and then go to Latin America. If I don’t… I’ll stay in Africa longer I guess. You’re very welcome. Thanks to you! Stay at a perfect small hotel at US$30/day downtown Seoul, South Korea.